Quick and simple Zucchini and Yellow Squash Salad for two! Or serve as a hearty vegetarian entree for one! 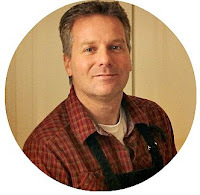 Hello my cooking friends! It’s Brent here, and today I have taken on the challenge to share a new and exciting way we can make good use of the ever-abundant zucchini that is available this time of year. I love the taste of pan-fried zucchini topped with Parmesan cheese so I used it as a starting point for this adaptable summer squash salad recipe. 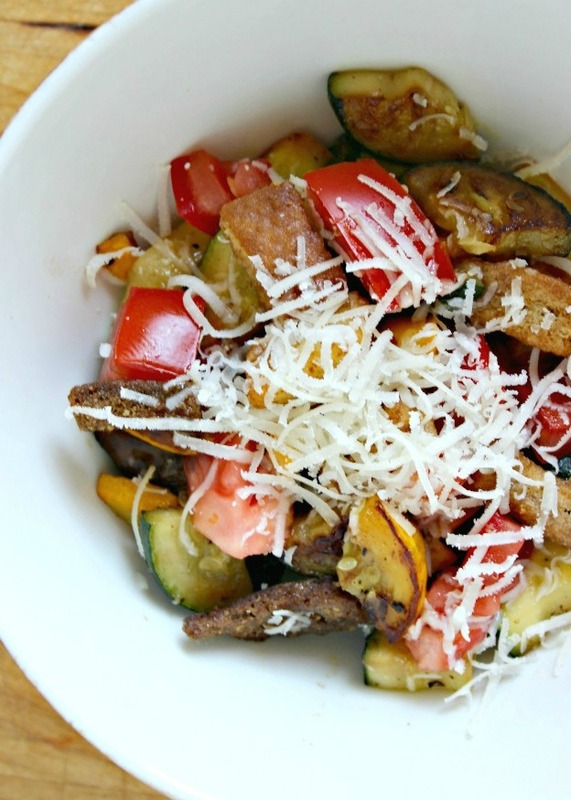 A ripe tomato, sitting on my kitchen counter, looked like a good match for the lightly browned zucchini and yellow squash in my skillet - so I chopped it up. 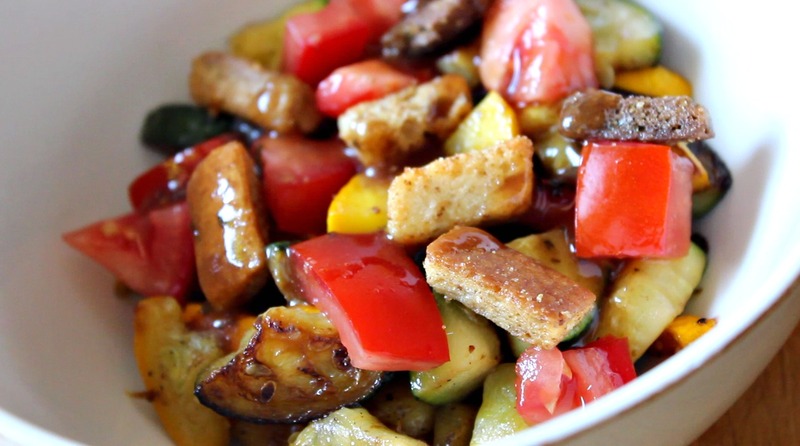 Along with the chopped tomato, I dressed my pan-fried vegetables with crunchy croutons, tangy balsamic vinaigrette, and freshly grated Parmesan cheese. Feel free to experiment and add-in your own favorite toppings to make this salad recipe your own. Flavorful, zesty, crunchy and delicious! After my wife Robin and I sank our forks into this pan-fried summer squash salad, we both agreed it's a great way to use up zucchini and a dish we'd both make again! Below are the recipe details on how to make! 1. 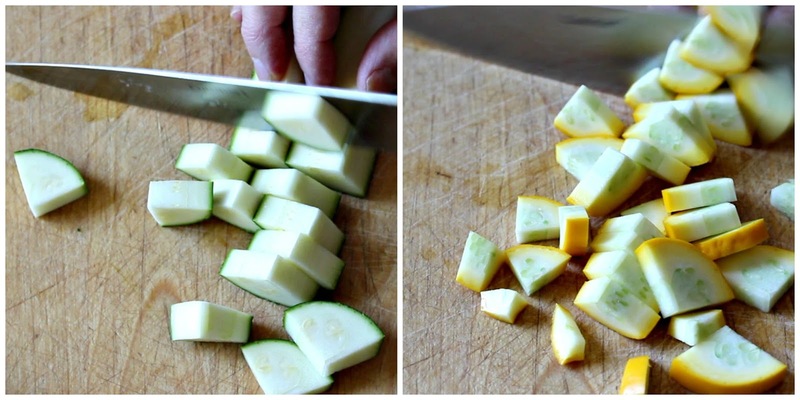 Start by chopping the zucchini and yellow squash into bite-sized pieces. I half and quarter them lengthwise, then I chop them into similar-sized triangles for even cooking. While we're in chopping mode, we can also chop the fresh ripe tomato. Voila! The chopping is done! 2. In a large skillet, melt the butter with oil over medium heat - the oil helps prevent the butter from burning. 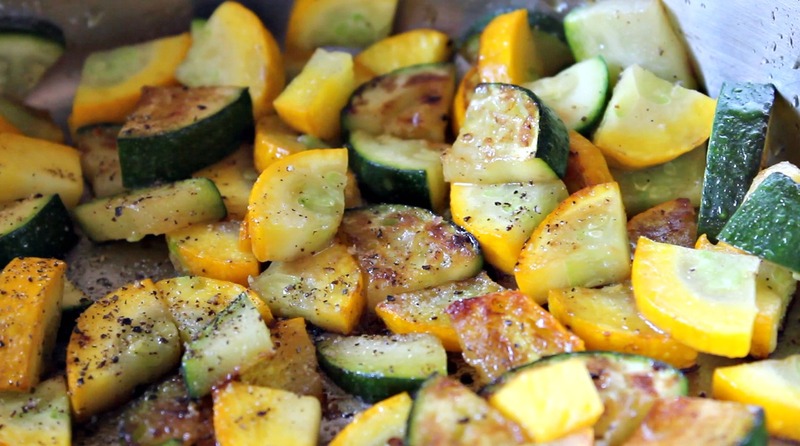 Once the butter has melted, add the zucchini and yellow squash to the pan (it should sizzle). Lightly season with salt and pepper, then stir. 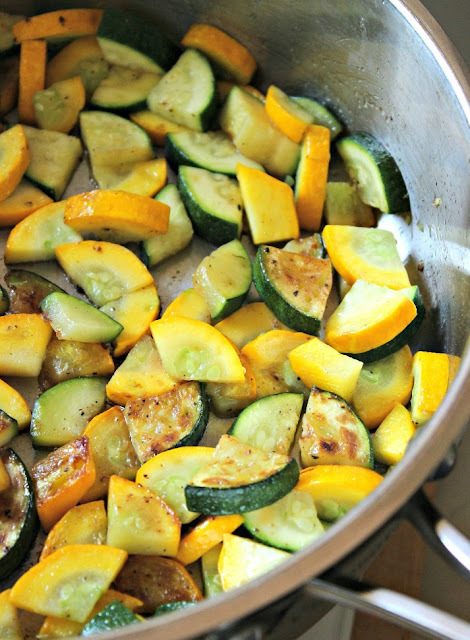 Spread the vegetables to get as many zucchini and summer squash pieces in contact with the skillet as possible. 3. 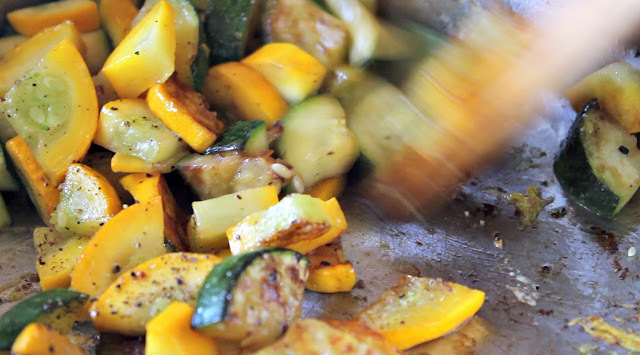 Allow the skillet time to brown the outside of the vegetables. Let them cook for 2 to 3 minutes before stirring with a spoon. 4. After stirring the vegetables, spread them out again to brown the other side of each piece of zucchini and yellow squash. Lightly season with salt and pepper, then give it one more stir before removing the pan from the heat. Time to assemble our salad! 5. Divide the pan-fried vegetables between two bowls. Top each with half the chopped tomato. 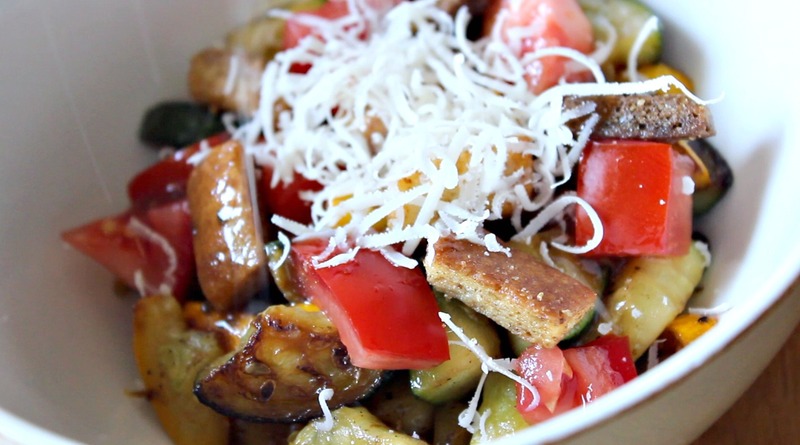 In each bowl, finish with an equal amount of crunchy croutons, balsamic vinaigrette, and freshly grated Parmesan cheese. Like this recipe? 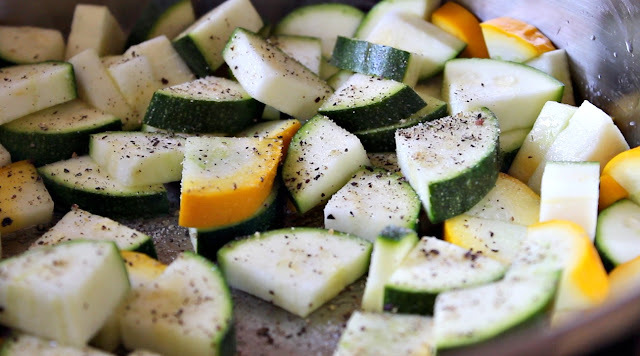 Share the zucchini love by sharing this meal idea with fellow zucchini eating (or growing) friends using the social buttons below! Ciao for now! Hi I'm Brent! 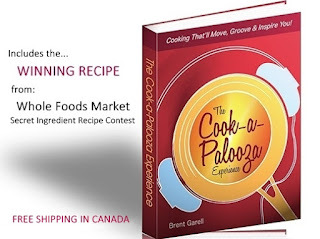 I love to cook (and eat) great tasting meals that are easy to prepare! 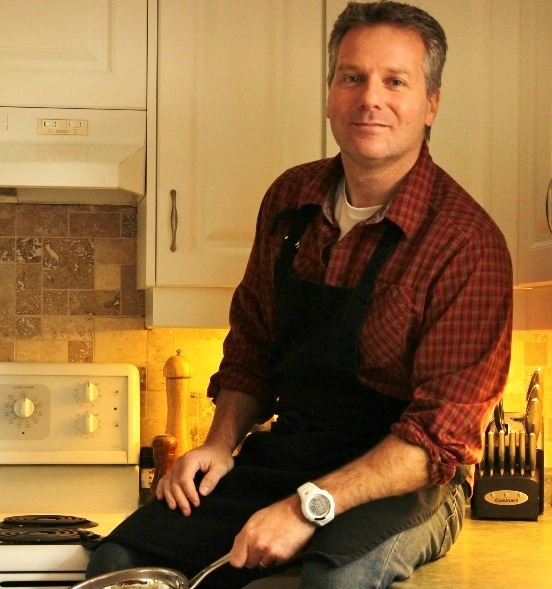 When I'm not posting recipes here, you'll find me teaching cooking classes in the greater Toronto area and online at Skillet Pro Jumpstart. Did you make today's recipe? Tag @cookapalooza on Instagram - makes my day seeing your tasty version!